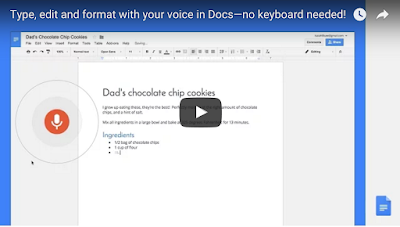 Google announced today the release of a new voice feature in Google Docs. This is basically a voice enabled formatting functionality that allows Docs users to easily edit and format their documents using voice commands. This new feature comes to complete the Voice Typing functionality that was added to Google Docs a few months ago. Users of Google Docs are now able to not only compose documents and write down notes without touching their keyboards but are also able to format their documents using speech commands such as “copy,” “insert table,” and “highlight.” You can check the full list of commands from this page. As of right now, this new feature is only available for Google Docs on Chrome. "To get started, select "Voice typing" in the "Tools" menu when you’re using Docs in Chrome. Say what comes to mind then start editing and formatting with commands". Watch this video to learn more about this new feature.